These Energized Semiprecious Howlite is called the "attunement stone," linking the user to higher spiritual consciousness, and opens and prepares the mind to receive the energies and wisdom of attunements. As a stress reducer, can be helpful in the workplace by wearing one of these bracelets. When caught in a particularly stressful situation. Howlite is a soothing and calming stone, and helps with an overactive mind and insomnia. Howlite is often used to help one to recognize the impact of their own actions and behaviors. Using Howlite can help one to remember the importance of tactfulness in dealings with others. Howlite also brings mental awareness, both to current and past-life issues, and facilitates calm communication. 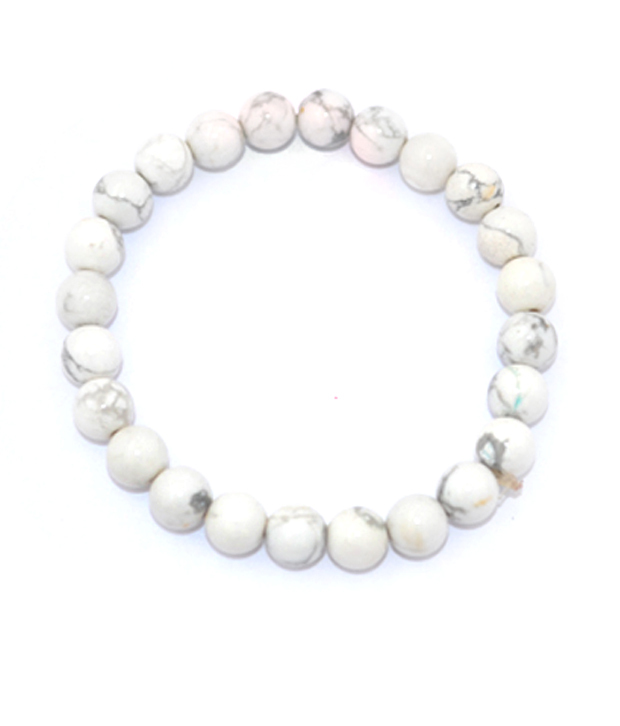 Howlite can absorb anger and negative energy. Use Howlite to open the Third-Eye in preparation for Attunements and Meditations, or to boost creativity. Disclaimer: These Semi Precious stone/Beads are believed to bring about all the good things. We do not guarntee its success and are not responsible for any claims. Any person with a conditions requiring medical attension should consult a qualified practitioner or therapist. Product colour may slightly vary due to photographic lighting sources or your Screen settings.